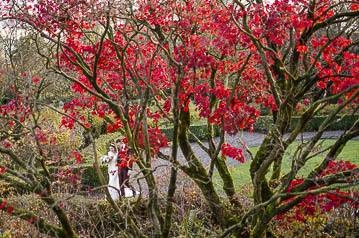 Are you thinking of an Autumn wedding? Well you won’t be disappointed with Eaves Hall. The reds and oranges found on the trees of the formal gardens and Lancashire countryside look amazing in the Autumn light. Eaves Hall and the surrounding gardens are beautiful, end of. 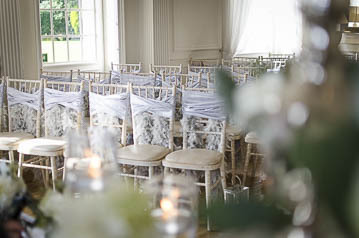 This magnificent Georgian mansion is set in the beautiful Ribble Valley and feels very special. As you walk into the ornate dark panelled hall, the large chandelier and beautiful grand piano set a beautiful tone for a wedding no-one will forget. Top tip: The formal gardens in front of the hall are fantastic for couple portraits. I like to ask the couple to walk round the gardens and have a chat about the day’s events so far. This gives me an opportunity to go all “fine art” – photographing through trees and bushes to get natural images of happy newly weds! There are lots of interesting spaces in this elegant mansion. There’s Function Room, the Ballroom, the Snug, the Bar and the Snooker Room, the Terrace… did I already mention the magnificent hall way? I also really like the seating area at the top of the main staircase – it’s quite a nice quirky spot to chill with Whiskey Sour and some good company. Top Tip: The balcony of the master bedroom provides a great vantage point for your “Everybody” photograph. 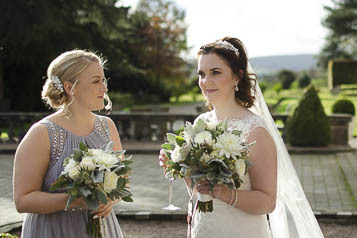 The Lodge, set slightly away from the main hall, gives brides and their bridesmaids a lovely secluded spot to stay in the night before so they are fresh and excited for the day ahead. Make sure you check that it’s available for your day. Top tip: ask your guests that once they have dropped off their gear, to park their cars at the lower car park. This may seem a weird tip but I really love to take a backlit image of couples in front of the hall at night and you really don’t want a car parked in front of the hall for your night images. I really liked the staff, they were fun, friendly and looked after us. The food is fantastic. Best suppliers meal I’ve had! There is space near the hall to drop off gear, then the parking is at the foot of the gardens. It is a bit of a walk with my large bag of light stands – but it is a really nice walk through the gardens. It’s a little off the beaten path, but at only 10 minutes drive from Clitheroe train station it is easily accessible for your guests. Price – it’s a beautiful country mansion so it does fall into one of the higher price brackets. I would suggest having a chat with them and talk through your budget. Eaves Hall is an exceptional mansion, set in a beautiful part of the world that makes a fantastic backdrop for a truly unforgettable wedding.